Bruce Willis sleepwalks through this remake of the 1974 vigilante urban western "Death Wish." The new version moves the action from New York City to Chicago, where Willis works as a trauma surgeon. One night at a restaurant with his family, a valet overhears Willis' plans for a future outing. The valet downloads their address and sells the info to a gang of thieves. Of course, Willis' wife and daughter stay home on the night in question. The plan goes wrong and both women are shot. Now seeking justice, Willis takes matters into his own hands, gunning down bad guys. Social media dubs him "The Grim Reaper" or the NRA's "good guy with a gun." 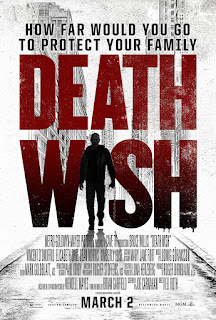 "Death Wish" arrives with low expectations. In fairness, this remake gets a helping hand from tight editing and an economical running time. It sets up several quiet but tough guy scenes, that play to Bruce Willis' strength. Dean Norris (best known as Walter White's clueless DEA brother in law in "Breaking Bad") adds a familiar vibe as a clueless Chicago detective. Vincent D'Onofrio doesn't get much as Willis' down-on-his-luck brother, but makes a good suspect. Elisabeth Shue disappears too soon as Willis' crime victim wife. The bad guys of "Death Wish" are really bad, and the movie requires little from viewers. 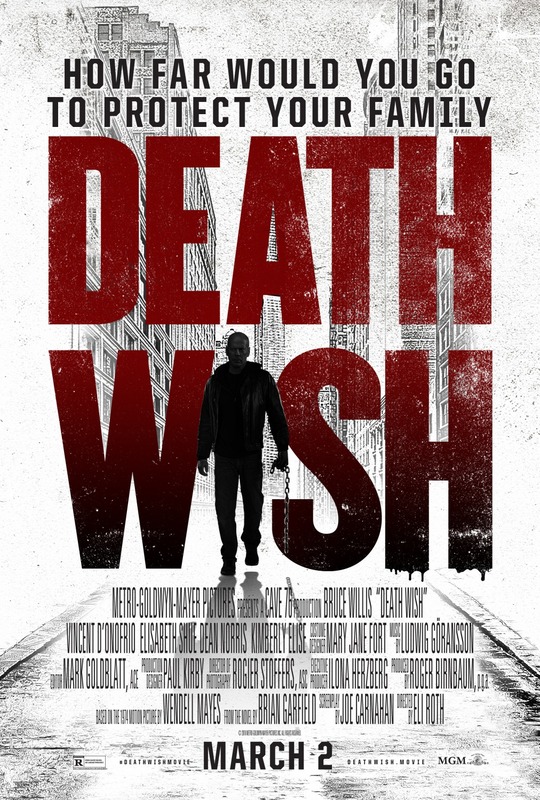 "Death Wish," 2 stars, rated "R." Does it deliver what it promises? Vigilante story. Is it entertaining? Short. Is it worth the price of admission? Up to you.